Explore the relationship between physical training and athletic performance in your student-athletes. 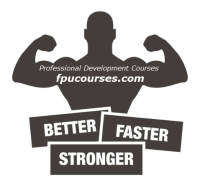 You will learn how to develop an individualized training program for sports and fitness enthusiast. Teach your students the importance of healthy life skills. Through these standards-based courses, health concepts and principles will be applied to promote an opportunity for positve self-esteem and healthy relationships. Think about the various elements of successful coaching beyond simply the skill requirements of the respective sport. The profession requires the coach to successfully organize, lead, and motivate their athletes. These courses offer opportunities for teachers to explore meaningful interdisciplinary connections. Research and experience confirm that skills and knowledge taught in a holistic way are more likely to be relevant to learners. Teach your students to become physically educated and active young people. Enhance their knowledge about physical activity as it provides opportunity for enjoyment, self-expression, and social interaction. Enhance science content understanding through through these practical, standards-based courses. Courses include creative thinking processes, manipulative and communicative skills across all grades. Refreshing with content and programs specific to your area can help you stay up-to-date on the knowledge acquired during your early years of education and the hands-on skills you’ve gained on the job. Whether you’re looking for a new role or wanting to grow your current position, taking on professional development courses can give you a competitive edge. Are you in the know about the latest scientific information to help you in the classroom? Continuing education helps professionals stay informed about their profession and shows employers you have ongoing dedication and engagement with your career. Working with the same content for a long period of time can become lackluster. To increase your dedication and creativity, some professionals find continuing education helps them to reconnect with their passion for a particular industry niche.